Ah, New Year’s resolutions. The lofty goals we set in good faith to improve upon ourselves. They never actually happen, am I right? Either you forget the next day, or something gets in the way that stops you from following through on them. But, 2018 is going to be different. This will be the year where you start making technology keep you to your word, thanks to IFTTT. No, that’s not a typo. IFTTT (If This Then That) is a fun, totally unique service that’s all about setting up automated processes, called “recipes”, that follow this basic formula: If this happens + That happens = Something else will happen. Still confused? Here’s an example of how it can work: If you post a picture on Instagram, IFTTT can automatically post it on your other social media apps. It goes much deeper than that. More complex, fascinating recipes can take advantage of your GPS location and trigger an action, to name an example. Like, when you enter your work building, your smartphone’s ringer will automatically be set to vibrate. The rabbit hole of these so-called “recipes” is endless, and endlessly amazing. You can even create your own, if you feel that your needs haven't been covered by what's already available. 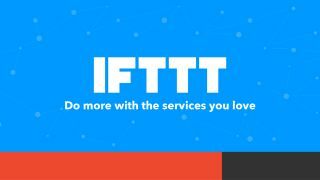 Here’s a list of common New Year’s resolutions, and how IFTTT can help you actually achieve them for once in 2018. We've also included a few helpful use cases to get you motivated. Good luck! Probably the most common resolution for the new year, losing weight also happens to be one of the most difficult to accomplish. IFTTT won’t magically whisper the pounds away, but it can help keep you in check. Here are a few recipes that will aid you in achieving your goal. Click to visit IFTTT and add it to your list of applets. Use case: You walk in the door, and when Google OnHub detects your device, it pings a notification to you saying something along the lines of "Don't forget to go to the gym tonight". Use case: This one's pretty obvious, right? Many smart scales can be connected with IFTTT, and can also be tied into Google services to record weight data. It's a handy, hands-free way of keeping track of progress. Use case: Fitness tracker apps do a good job of telling you how many steps you've marched in a day, but nothing beats seeing it in a good ol' spreadsheet. That way, you can add custom formulas to monitor trends, or just see things without a fancy user interface getting in the way. Many people find themselves in need of a cash reserve, even if it’s just a small one. Trouble is, your life does a pretty good job of reducing each paycheck down to spare dollars and cents. So, it’s time, once again, for IFTTT to step in and help out. Here are some recipes that can put saving into focus and keep it there. Use case: This is perfect for those who are constantly on the verge of making a bad purchasing decision. If you're able to steer yourself out an unnecessary purchase, reward yourself with a click of the button. Additionally, you'll rack up a huge savings if you make a habit of tapping it once a day. Use case: For those constantly chasing "two birds, one stone" opportunities, this one is for you. It utilizes your phone's GPS location to save a set amount of money when you walk into your gym's geo-fence. That way, you're getting fit and saving cash. Use case: This applet will feed every bit of savings activity into a spreadsheet, which is perfect for monitoring your progress. It's a simple, easy applet, but one that could help you meet your goal. Learning never stops, and thanks to the internet, it’s easier than ever to add new information to the old noodle. But that takes time, and IFTTT can help you get back to the more important things in life (like accomplishing your other New Year’s resolutions) and quickly send important news articles, or just the odd fun fact, straight to you. Although this goal seems like a small one, keeping a healthy work/life balance can have a tremendously positive impact. Instead of working your way through the night or during the weekend, you can spend more time with friends and loved ones, focus on personal projects, and just generally refresh yourself for the work week ahead. This IFTTT applet syncs up with your Philips Hue smart light bulbs to offer up a warning blink to remind you to go to bed. Use case: It's hard to turn off some days, so whether this is for you or the kids, a gentle reminder that's impossible not to notice (unless you're already asleep) is an instant recommendation. Have a Fitbit? This applet will buzz you with a notification if you miss your sleep target last night. Use case: Sleep is such a crucial component to not just living, but to your diet or workout plan, too. If you slack on sleep, you'll feel it and it will affect your mood, appetite, decision-making. Basically, everything. With this applet, you'll get a reminder to help you get back on schedule.